This is what happens when I have a long weekend. I have time for proper breakfast. As smug as I might sound, this omelette is not harder or more time consuming than say making my coffee. It just makes more dishes to wash up but that’s what the dishwasher is for! The time it takes for my water to heat up, my omelette can be cooking in the pan. 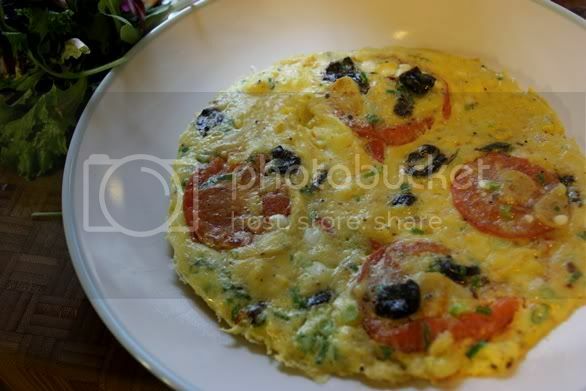 This omelette is dressed up with chives, 1 small dollop of cream cheese, slices of tomatoes and pieces of black oily olives. Then it’s topped with some mixed salad greens, a drizzle of fig molasses*, preserved figs* and olive oil. Add the cream cheese, olives and chives into egg and stir to combine well. Set aside and do not over mix the egg mixture. 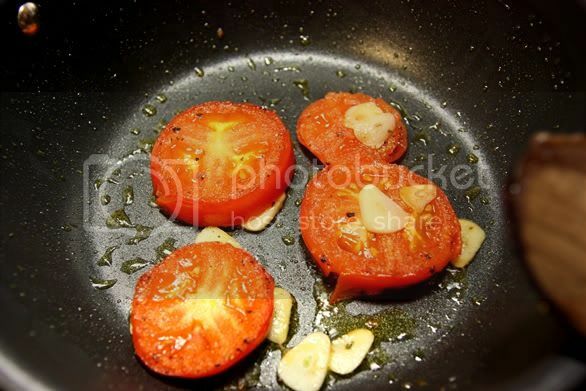 Heat non-stick pan with some oil and sear the tomato slices with garlic until nice and brown around the corners. Season with some salt and pepper. Pour the egg mixture in and around the eggs. With a spatula, move around the egg mixture, making crevices and watch the crevices fill with egg mixture again. Making these crevices makes for a fluffier omelette – and that’s your tip for the day. Go about doing it until you see that crevices gets filled up slower, at this point lower the heat to low. Cook covered for 1 minute and your omelette is done. Don’t have a cover for your non-stick? I just use a plate. ** The fig molasses and fig preserves came from the same jar. I bought a crate of fresh figs one day at the market because I couldn’t resist how plump and voluptuous each purple figs were. Cutting through them revealed this lovely blushing flesh that makes you want to eat them all day. I couldn’t finish the whole crate so what did I do with the rest? I preserved them in balsamic vinegar. I let the preserving liquid reduced into a thick and glossy syrup and left the figs in it. This wonderful condiment is sitting in my fridge and I use it for salads or as an accompaniment to meat or omelettes. The balsamic preserved figs sounds so good. I am sure it goes well with any meats or salad. 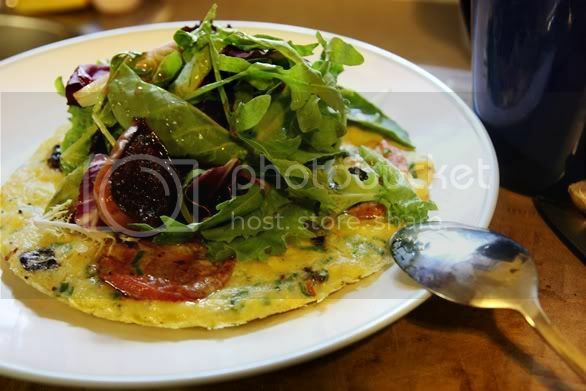 What an awesome omelette! Looks delish! Great pictures! I love using figs in salads! I will have to try them with an omelette sometime. what a great idea!